Lord Burghley and Episcopacy, 1577-1603 examines the selection and promotion of bishops within the shifting sands of ecclesiastical politics at the Elizabethan court, drawing on the copious correspondence of leading politicians and clerical candidates as well as the Exchequer records of the financial arrangements accompanying each appointment. 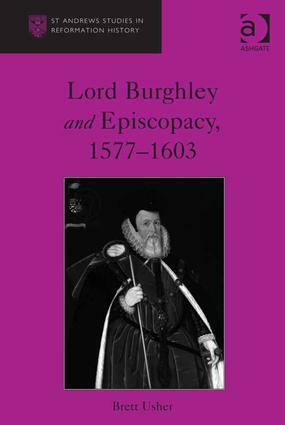 Beginning in 1577, the book picks up the narrative where Brett Usher's previous book (William Cecil and Episcopacy, 1559-1577) left off, following the fall of Archbishop Grindal, which brought the Elizabethan church to the brink of disaster. The book begins with an outline of the period under review, challenging the traditional view of corruption and decline. Instead Usher provides a more complex picture, emphasizing the importance of court rivalries over patronage and place, and a broadly more benign attitude from the Exchequer, which distinguishes the period from the first half of the reign. Within this milieu the book situates the dominance of the Cecils - father and son - in ecclesiastical affairs as the key continuity between the two halves of Elizabeth's reign. Providing a fresh analysis of the Burghley's long and influential role within Elizabethan government, Usher both illuminates court politics and the workings of the Exchequer, as well as the practical operation of Elizabeth's supremacy. Specifically he demonstrates how Elizabeth learnt a valuable lesson from the debacle over the fall of Grindal, and from the late 1570s, rather than taking the lead, customarily she looked to her councillors and courtiers to come to some accommodation with each other before she would authorize appointments and promotions. Note: Brett Usher died in 2013 before the publication of this book. Final editing of the typescript was undertaken by Professor Kenneth Fincham of the University of Kent, who also guided the book through the publication process. Brett Usher: a tribute; Preface; Introduction: episcopal roles and reputations, 1577-1603; The struggle for mastery of the episcopal bench, 1576-83; Taming Whitgift, 1583-89; Burghley undaunted, 1589-94; The transformation of the bench, 1594-98; Conclusion: the end of the reign, 1599-1603; Appendices; Brett Usher: publications, 1992-2010; Bibliography; Index. A former Visiting Research Fellow at the University of Reading in History and author of William Cecil and Episcopacy, 1559-1577 (Ashgate, 2003), Brett Usher died in June 2013.